The 16 Gauge shotgun may have taken a precarious dip in popularity since its hay day last century, but the old American workhorse is still alive and well so long as we deem it so by continuing to use it. 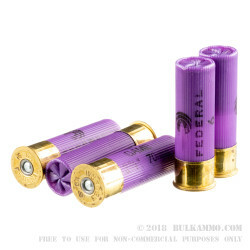 If you admire the old shotgun’s performance, then you’ll certainly appreciate this 16 Gauge shell by Federal. 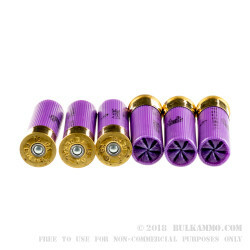 This shotshell is loaded with one ounce of #6 lead shot, or approximately 225 of the .11” pellets to be more precise. This shot size reliably provides about one foot of kill zone at 35 yards, in which you can sreliably drop maller game birds. Squirrel and rabbit are no match for this shot either, making it a versatile choice for hunting. 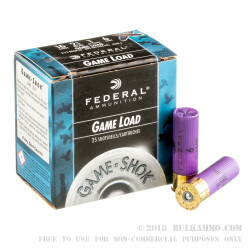 Federal touts their Game-Shok line of shotshells as being carefully crafted and packed with features that provide reliable, effective performance on a variety of upland game. This fine shell certainly lives up to that promise.